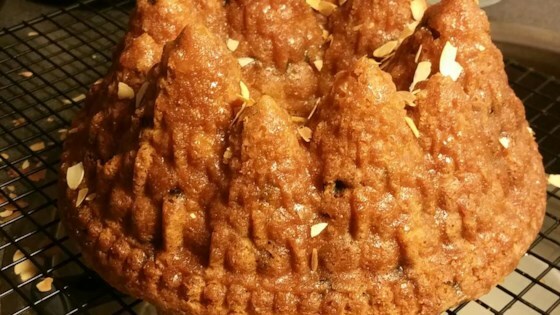 "A sumptuous holiday pound cake with a Northwestern flavor. Excellent for Christmas buffets or open houses!" In a small bowl, combine dried blueberries, dried cherries, dried cranberries, and 2 tablespoons brandy. Soak for 15 minutes. Preheat oven to 325 degrees F (165 degrees C). Grease and flour a 10 inch tube pan or Bundt pan. Sift together the flour, baking powder, salt, and nutmeg; set aside. In a large bowl, cream together the butter and 2 cups sugar until light and fluffy. Beat in the eggs one at a time, then stir in the vanilla. Beat in the flour mixture alternately with the eggnog, mixing just until incorporated. Fold in soaked fruit mixture. Spread batter into prepared pan. Bake in the preheated oven for 55 minutes, or until a toothpick inserted into the center of the cake comes out clean. Let cool in pan for 10 minutes, then turn out onto a wire rack. In a small bowl, mix together brandy, water, and 3/4 cup sugar. With pastry brush, brush entire surface of cake with glaze. Cool completely before serving. This is destined to become a family holiday favorite. So good! Followed the recipe and I really like the taste, but it came out pretty dry. An instant holiday favorite! I can see myself making this every year! I was going to take this to work, but my husband wouldn't let me. :) Thanks a bunch! I made this recipe last year for friends and family, it was a hit! They asked me to do it again this year. I made individual loafs. really taste , i used 1 cup of cranberries only for fruitsand i added 1 tbs ginger.